We all remember the first time watching the bright rays of the sun reach above the horizon to welcome a new day. Or maybe it’s the first time floating on a boat at twilight while the ripples lap against the hull and the sound of a bottlenose dolphin’s forceful exhale breaks the surface of the lagoon. “First times” on, in, near or around the Indian River Lagoon are unforgettable and each of us have our own story to share. For more than twenty years you’ve helped us provide “first time” stories for thousands of guests annually. These stories are shared at the dinner table, on social media and throughout the community and become part of a larger conversation about who we are and how we work together to save the Indian River Lagoon. Because of you we continue to create “first time” stories and achieve recognition for our work. 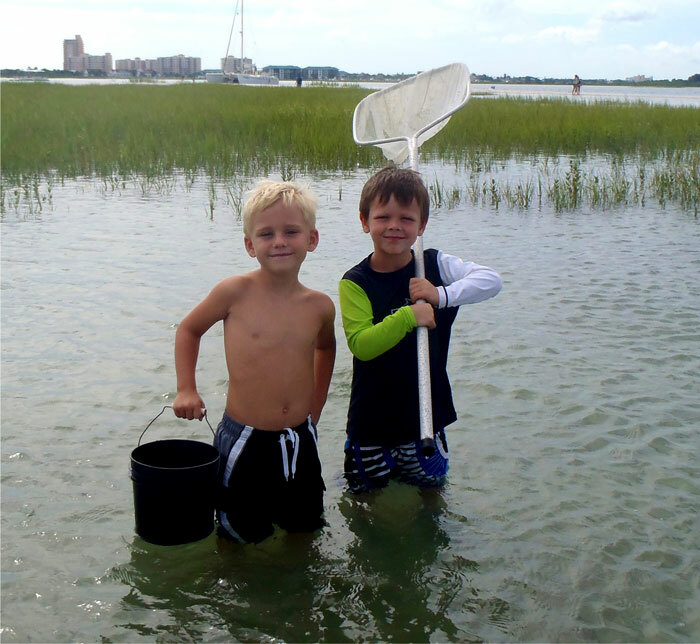 Disadvantaged youth gained higher achievement test scores when their education was supplemented with “hands on feet wet” activities at the Marine Discovery Center. The Association of Nature Center Administrators recognized the MDC for its superior leadership. More adult and youth programs than ever inspired 8,296 people who love the Lagoon. Strategic blueprints for a vibrant future came alive with the construction of an amphitheater, native landscaping and trails. A volunteer base of 466 individuals donated 11,635 hours of time on behalf of the Center and Indian River Lagoon. Your annual gifts make it possible for the Marine Discovery Center to answer needs for information about the Indian River Lagoon, to provide opportunities for citizen science participation and to act on your passion. This year we’re kicking off our end of year appeal on #GivingTuesday with 35 Days of Love for the Lagoon. Celebrated on the Tuesday following Thanksgiving (in the U.S.) and the widely recognized shopping events Black Friday and Cyber Monday, #GivingTuesday kicks off the charitable season, when many focus on their holiday and end-of-year giving. This year we encourage you to support your local conservation charity: Marine Discovery Center. The Marine Discovery Center receives no annual funding from government agencies. You can help ensure the Center’s success in our 22nd year, 2019, by making a gift of $1000, $500, $100, $50 or $25. You may pledge a sustaining gift via automatic credit card donations or you can donate right here on our website. Maybe you’d like to provide a sustaining gift by becoming a Dolphin Society member with a gift of $83.33/month for the next 5 years. Please also check for matching opportunities at your work or contact me directly at 386.679.3622 to discuss how you’d like to be involved. The long-range vision of the Marine Discovery Center is for you and future generations to see a healthy Indian River Lagoon enjoyed for its natural beauty, unmatched diversity of species and rich fishery. We do not take you nor the Lagoon for granted. We are most grateful for your past gifts and promise to continue to be faithful stewards of your gifts and the Indian River Lagoon. Please make your gift today! Because of you, the Marine Discovery Center is celebrating 20 years of community engagement through exploration, conservation and education. Together we’ve restored living shorelines, counted horseshoe crabs, measured seagrass, rescued dolphins, manatees and pelicans and most importantly educated over 30,000 people annually to create the next generation of ambassadors for the Indian River Lagoon. As a community we all understand that our shared future, recreation, livelihood and investments will thrive as the Indian River Lagoon thrives. We’ve also been reminded recently of the vulnerability of this special body of water and how important it is to our economy, community and overall way of life. At 20 years old, the Marine Discovery Center is a proven reliable steward of environmental and financial resources. Your gifts to the Marine Discovery Center are an investment in a respected and trusted environmental leader and this year contributions will have doubled the impact! In celebration of our 20th anniversary all donations will be matched dollar for dollar up to $20,000 towards our endowment fund! Please make a gift of $500, $100, $50 or $25 to protect our common interests in the Lagoon through Marine Discovery Center’s work. Each dollar you give is a promise to support a mutual-heartfelt commitment to determined efforts by the Marine Discovery Center toward Lagoon health, awareness, and sustainability. You may also pledge a sustaining gift via automatic credit card donations, you can donate online using any of the “donate” buttons on our site. You may contact me directly at 386-679-3622 regarding gift planning, becoming a member of the Dolphin Society or making an IRA qualified charitable contribution. Also, please remember to check with your place of business to see if it will match your charitable contribution. Special 20th Anniversary gifts of at least $1,000 made by December 31, 2017 will be listed with your name on an anniversary plaque at the Marine Discovery Center. Because of your support, through the years, the Marine Discovery Center has earned credibility and established far-reaching revered relationships. Loyal friends, Dolphin Society members, volunteers, and corporate partners join in the knowledge that together we make a difference.